That last byline is rather strange, if you think about it. Kendall Foster Crossen was the author�s real name, and M. E. Chaber was the name he used to write his �Milo March� novels. 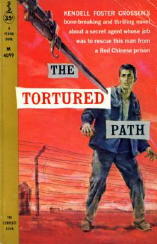 Paperback Library had been publishing these in uniform editions, all with hugely attractive covers by Robert McGinnis. They must have done well with them, because they when they ran out of Milo March�s adventures to print, to capitalize on Chaber�s popularity, they started doing some of Crossen�s other work in the same numbered format, including this one and several he wrote as by Christopher Monig. Why the switch in bylines, I don�t know, but it may have had something to do with the switch in publishers. The Big Dive is scarce; it was never reprinted in paperback, and at the moment, there are only two copies of the hardcover edition offered for sale on the Internet. While The Gentle Assassin never had a paperback edition either, it is fairly common in hardcover. It�s also easily available in a three-in-one Detective Book Club edition. “It started out like any other day in Washington. I�d been cooling my heels there for three months. I was theoretically on duty but I hadn�t anything to do for that length of time. The first month was fine, but then I began to get a little tired of it. I didn�t have an assignment, but I was supposed to check in three times a day. After three months, just checking in was beginning to interfere with my drinking. One thing you can say about Washington � the hunting in the cocktail bars was fine. His assignment? To get himself caught by the Chinese Communists, be brainwashed and undergo any other form of torture they might devise for him, and then rescue an American officer who has secrets that mustn�t fall into enemy hands. Which he does. End of book. Well, not quite, but almost. Getting in is far too easy, getting out is another matter, sort of the scorched-earth approach, if you ask me, crude but effective. Crossen has a quiet, breezy style of story-telling, beginning (as you will have seen) with page one onward. The resulting adventure is readable in about a night or two. It is also largely forgettable in about the same length of time. I was lucky enough, on a slow day, to find your site. I’m glad I did. I’ve bookmarked “Mystery*File” and will be coming back (hopefully) often. Crossen was also pulpster Richard Foster who wrote the adventures of Jethro Drumm, the Green Lama, who also had a radio series and a comic book drawn by the great Mac Raboy. Crossen also did two books about Nero Wolfe wanna-be Jupiter Jones. By far the Milo March books were his most successful venture even inspiring a film, The Man Inside with Jack Palance and Anita Eckberg.